The scope of Oral and Maxillofacial Surgery is extensive and includes the management of facial injuries, head and neck cancers, salivary gland diseases, facial disproportion, facial pain, temporomandibular joint disorders, impacted teeth, missing teeth with implants, cysts and tumours of the jaws, aesthetic facial surgery, as well as numerous problems affecting the oral mucosa such as mouth ulcers and infections. 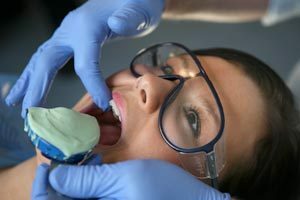 Dentoalveolar Surgery – surgical management including specific diseases of the teeth and their supporting hard tissues. Also missing teeth and alveolar bone may be replaced with dental implants and grafted bone in specific situations. N.B. Referrals for dento-alveolar surgery must be accompanied by an appropriate recent high-quality radiograph of the affected tooth. Head and Neck Oncology – the management of head and neck cancer including the mouth, oropharynx, and the associated structures. Please see section for Suspected Cancer Referrals. Maxillofacial trauma – soft tissue injuries of the head and neck and injuries to all aspects of the facial skeleton, including dental injuries. Temporomandibular Joint Disorders – treatment of temporomandibular joint disorders to alleviate pain, improve function and to remove pathological conditions which may interfere with quality of life. Pre-Prosthetic Surgery and Implantology – to promote rehabilitation and enable the wearing of prostheses as well as the provision of dental implants. Salivary Gland Disorders – medical and surgical management of infections, calculi and strictures, cysts, tumours and the related disorders of the major and minor salivary glands. Surgery of Facial Deformity – this is concerned with the correction of developmental and acquired dentofacial deformity including facial disproportion of the tooth bearing segments of the jaws and associated facial skeleton. Surgical Dermatology – the surgical management of benign and malignant cutaneous disorders and their reconstruction. Cranio-Facial Deformity – Management of complex congenital and acquired anomalies of the head, face and jaws. Aesthetic Facial Surgery – the surgical management of patients requesting facial plastic surgery.